After five years in government, with the last three as prime minister, Aleksandar Vučić crowned his political career by winning the presidential elections of April 2nd. Probably aware of this, on May 31st he organized an oath ceremony that many Serbian citizens saw as a coronation. Vučić took his oath by placing his hand on a copy of the Constitution, created specifically for the occasion. Under it was the Miroslav Gospel – an absolute novelty compared to his predecessors' oaths. This gesture was probably meant to communicate that, in addition to laws, the new president will also respect Serbia's tradition and genealogy, Orthodox faith, and relics, like the most precious manuscript of Serbian cultural heritage. At the end of the oath ceremony, held at the parliament building, Vučić walked along a walkway – also paved especially for the occasion – to his new workplace, the palace of the presidency of the Republic. There, unlike the normal handover protocol, the chief of the General Staff was waiting to report to him, while outgoing president Tomislav Nikolić handed him the seal of state – another exception to the usual practice. Turning to his supporters, who never stopped acclaiming him, Vučić said, with paternal tones, that he loves them and that he will protect their children as if they were his own. So the newly-crowned leader, just one hour after his resignation as prime minister, found himself head of state. In this capacity, he will command the armed forces, coordinate all security services (a rather unusual function, that he also carried out as prime minister), and control the work of the government and the parliament. This last task is not prescribed by the Constitution but, judging from the words of Vučić's closest collaborators, there is no doubt that he will push the limits of his power to widen his relatively narrow presidential competences. In addition to winning 55.08% of votes in the presidential election, Vučić is the leader of the main party in the coalition that holds a solid majority in parliament. With such support, Vučić can expect to govern smoothly for the next five years. His only concern are the municipal elections in Belgrade, that should take place by the spring of 2018. It is in the capital that Vučić's power meets the strongest resistance. The unresolved Savamala scandal of over a year ago, which saw a group of masked men hold citizens hostage while demolishing a downtown area of ​​Belgrade, could cost him many votes. Hence the speculation that Vučić may decide to schedule early parliamentary elections at the same time as the elections in Belgrade. It would be the third time in three years that Vučić calls on the citizens, to quote his favourite phrase, to "reaffirm their confidence" in his reform policy. His first step as president will be to appoint the new prime minister and to form the "new" government. The new prime minister could be an official of his Serbian Progressive Party (SNS), one of the coalition partners – including Ivica Dačić, current foreign minister and leader of the Serbian Socialist Party (SPS) – or an independent expert, like those who are part of the outgoing government. The choice of the prime minister is expected to indicate the decision on early parliamentary elections. If Vučić were to pick a prime minister outside his party, the head of government would probably be seen as a provisional figure to be exploited until the early vote. What is certain is that the future prime minister, no matter where he comes from, will be totally subordinated to president Vučić's will. The way he has governed, made decisions, subjugated his coalition partners, got rid of opponents, and controlled the media shows that Vučić never lets anything and anybody threaten his power. In recent years, Vučić has done everything to ensure that the citizens of Serbia and their international partners forget the dark side of his political past. The last post he held before becoming an enthusiastic supporter of European integration for Serbia was that of minister of Information under Slobodan Milošević. It was a time when media not willing to support Milošević's policy were punished with draconian sanctions. A time when journalist Slavko Ćuruvija , one of the most stubborn opponents of the regime, was murdered during Vučić's term as minister of Information. The murder took place in full daylight, on Easter Sunday, 1999, during the NATO bombings. Since the beginning of the Nineties, as the closest collaborator of self-proclaimed Chetnik voivoda (leader) and head of the Serbian Radical Party Vojislav Šešelj, Vučić instigated the war against Bosniaks, Croats, and Albanians, tracing the borders of Greater Serbia. Yet, the day before taking on the presidency of the Republic, while giving his last speech as prime minister, Vučić showed a completely different map of the Balkans: "I drew this myself. While others were drawing boundaries, I was trying to trace highways and railways". These words were not meant as a rejection of the past, but as a sort of recommendation to the German chancellor Angela Merkel and to Brussels officials, that Vučić wanted to impress presenting himself as the main protagonist of a new cohesion among the Western Balkan countries. 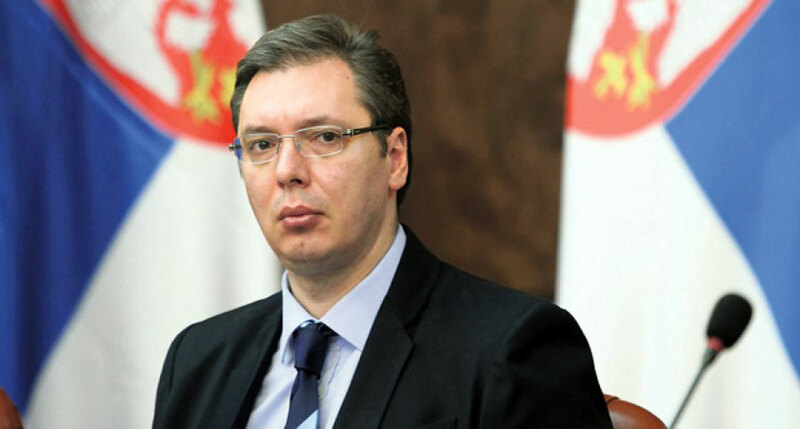 Vučić hopes that his Western interlocutors will forget about Belgrade's recent intrusion into the events related to the formation of the new Macedonian government, but also the rising tensions in the relations with Kosovo, and sometimes also with Bosnia and Herzegovina and Croatia. His main goal is to gain the reputation of a politician capable of maintaining the stability of the Balkans, which have been experiencing tensions for decades now. "Peace and stability", repeated Aleksandar Vučić before and after the coronation. The media he has been controlling for months talk of enemies preparing to attack Serbia from all sides, foreign services working to create a "Greater Albania", "internal traitors" plotting coups, and the opposition orchestrating a "Macedonian scenario". Many Serbian citizens, victims of such scaremongering, see in Vučić the only guarantor of security. For their part, EU officials openly speak of Serbia as a pillar of stability in the Balkans. They see Vučić as a partner they can negotiate with and who will eventually meet all their demands. The demands of the West aim at greater stability in the Balkans, including no more obstructing Kosovo's accession to the EU and the United Nations. As long as Vučić keeps cooperating towards this strategic goal, he will remain a welcome partner for Brussels and Washington. In a country where the opposition is powerless and disoriented, the media are controlled by the power, institutions are falling apart, citizens are impoverished and exhausted by a transition that does not seem to end, all Vučić should worry about is how to preserve his stabilocracy. So one wonders if any of his Western allies noticed that, a few hundred metres from the parliament building, while Vučić was proclaiming "peace and stability", some undercover guards, probably in charge of guarding the security of the ceremony, were manhandling citizens that had gathered to protest and journalists who wanted to interview them, all under the eyes of the police. Very few media outlets reported this incident, and only a few journalists ventured to talk about Vučić's "party police" that has been "bringing order" to Serbia for years. Everyone else keeps repeating the leader's mantra: "peace and stability... peace and stability...".